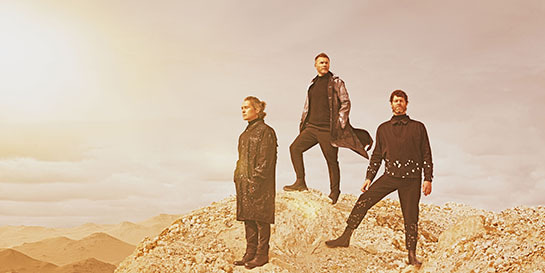 The 27-track greatest hits album, out today, gives fans the opportunity to hear Take That classics as they’ve never been heard before as well as featuring some exciting collaborations. The album’s lead single Out Of Our Heads, released on October 11, is one of three new tracks to appear on the album, alongside Odyssey versions of their 90s hits How Deep Is Your Love and Pray. Out Of Our Heads’ quirky music video premiered on Good Morning Britain at the beginning of the month and the band performed the track on Strictly Come Dancing last weekend, pushing it up the iTunes chart. Following their performance at the Bambi Awards ceremony in Germany last Friday, where they gave an emotive rendition of Greatest Day, the band have more special appearances to come. A Take That BBC One show special has been announced, for which fans have been asked to send in their own personal memories of the band to be included in the programme. The trio will also appear at this year’s Royal Variety Awards. The band featured in this week’s issue of Music Week where they chatted about their three decades of hits and their 2019 38-date tour which will kick off across the UK and Europe in April next year. Polydor have kept the band active on socials, where they’ve rolled out album teasers and partnered with Apple Music to release a Making of Odyssey exclusive interview.